What Is a Utility ATV? 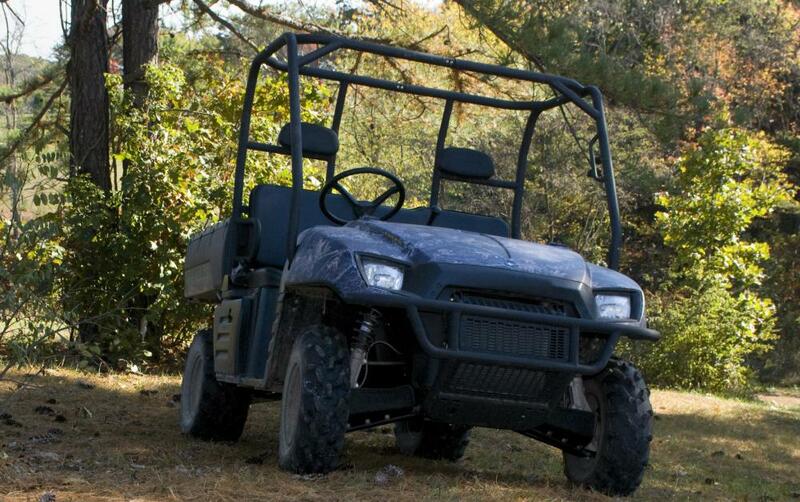 Utility all terrain vehicles look like golf carts, but are more rugged and can carry heavier loads. A utility ATV is a type of all-terrain vehicle that is specially designed to accommodate heavy-duty hauling or other types of work. The utility ATV is usually larger than other types of ATVs, and in many cases, it is likely to feature a cargo bed used for hauling large items. These vehicles are often used for maintenance purposes as well as travel through forests while hunting or even performing work tasks such as logging. The vehicle may also feature a canopy with a roll cage, and unlike other ATVs, two people may be able to ride in utility models. Most ATVs feature a seat that a rider will straddle to operate the machine. Some utility ATV models feature a similar design, though most larger models feature bucket seats similar to the ones found in a car or truck. Bench seats are also common; these seat types will accommodate more than one rider, thereby making the vehicle more versatile for work purposes. Some models may even be large enough to carry up to four people, though these are not as common as two-person models. The utility ATV will usually feature stronger suspension and longer wheel bases. Other features common on a utility ATV include winches, gun racks, and other equipment racks. Winches are mounted to the front of the vehicle and are used to help pull the ATV out of the mud, snow, or other difficult terrain should it get stuck. They can also be used to haul heavy items such as logs or rocks. Sometimes the winch is mounted to the rear of the vehicle for more convenient hauling. Winches are usually controlled with a hand controller that must be plugged into the winch itself. Radio controllers are also commonly used. Trailer hitches may also be mounted to the rear of the vehicle so trailers can be mounted to the utility ATV. The hitch can receive various inserts such as tillers for gardens and lawns, flatbed trailers, or other machinery useful for farming or cultivating. Hunters often find convenience in such ATVs because extra space is available for hauling off animals as well as camping equipment and hunting related equipment. Gun racks make storage of weapons easy and safe as well. Maintenance workers use utility ATV units for traveling over varied terrain and hauling tools to various locations; materials such as soil or sand can be loaded into the bed of the vehicle for added convenience. How Do I Choose the Best ATV Rear Seat? What Is an ATV Radio? What Is an ATV Hauler? What Are the Different Types of ATV Haulers? What Is a 150cc ATV? What Is a Hunting ATV?